When it comes to the art of storytelling, no-one seems to have mastered it quite so well as the Irish (as anyone who’s visited a Dublin pub late of an evening will attest). They just have a way of drawing you in and keeping you enthralled, entertained and enchanted. And when it comes to telling the story of Ireland itself, no road could lead you on a more fascinating, stunningly scenic, quintessentially Irish path than the Wild Atlantic Way, a newly-unveiled, 2400km coastal route along the West Coast of Ireland. 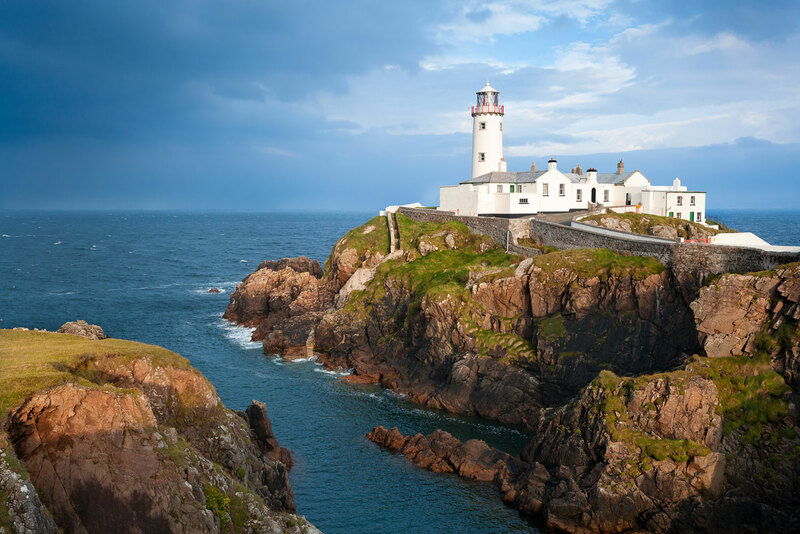 Winding along the length of the Emerald Isle, from the northern tip of the Inishowen Peninsula in Donegal to Kinsale in Cork, the breathtaking journey is the longest fully-signposted driving route in the world, presenting visitors with a huge array of potential stopping-off points. Whether you choose to tackle the full length in a bucket-list journey; or pick a shorter section to explore in detail, The Wild Atlantic Way is a fantastic way to see straight into the heart of this beautiful country, away from the bigger cities like Belfast and Dublin that usually capture visitors’ attention. The route seamlessly weaves together so many of the facets of culture, scenery and, well, ‘Irishness’, that make this country so magically unique. Ireland’s famously verdant rolling hills play gentle counterpoint to the vicious, toiling waves of the Atlantic; while ruggedly dramatic cliffs along the coastline give way to quiet, quaint fishing villages and warm, welcoming pubs, with steaming fresh seafood and hearty ales to soothe weary travellers into a joyful evening with the locals. Avid photographers will be tempted to stop off whenever a particularly jaw-dropping view comes into sight, such as along the Knockalla Coast Road, which boasts vistas across the Inishowen Peninsula and down to Ballymastocker Bay – once voted the second most beautiful beach in the world by the UK’s Observer newspaper (not bad for a country better known for its stunning countryside and rollicking good times to be had indoors). History buffs can gorge themselves on everything from medieval castles to ruined coastal fortifications and tiny towns holding on to past secrets. There’s no better way to understand Ireland’s rich history than to hear it from the mouth of a local: at Kinsale, you can hitch a ride with former fisherman Jerome on his boat The Spirit of Kinsale as he takes you out across the harbour onto the Atlantic’s edge, all the while sharing riveting stories about this former Viking trading post that helped shape Irish history; of ancient battles and tragic shipwrecks. Or visit Tory Island, which still follows a traditional Irish way of life and has elected its own King since the 6th century. Surfers can get their adrenalin fix at hotpots like Sligo, where ‘Prowlers’ boasts monster swells up to 100 feet tall. If you’re not a pro yet, there are surf schools at nearby Bundoran, which hosts the International Surfing Festival in June. Nature-lovers will have a field day with the bottlenose dolphins at the mouth of the Shannon River, which joins the ocean off County Clare’s Loop Head Peninsula. The enormous, rocky cliffs here also play home to grey seals, wild mountain goats and thousands of seabirds. There’s kayaking and horseriding along wild and woolly beaches; traditional arts and crafts, and fantastic eating and drinking to be done along the way, too. Ruggedly wild and serenely mild in equal measure, the Wild Atlantic Way is a new bucket-list item that will open your eyes to another side of this magical country. For more information, visit www.Ireland.com or call Tourism Ireland (02) 9964 6900. Ireland is truly beautiful, and the Irish are truly beautiful … but 2400km is nuthin’! Come visit t’other side of the planet (Western Australia, to be sure, to be sure now) … we drive 2,400km (in a day!) just to go fishin’! Our beaches are also beautiful, our women are beautiful too, but if you go swimmin’ in the ocean … the giant sharks are like humans in a masked wine tasting … hmmmm, nice nose (ammonia from various sources/sauces), and nice colour (they only see in seal-grey) … and as for the taste test (a sip for humans, a huge bite for a shark, then review in the brain’s memory … in humans this is vast, in sharks it’s either yum or yuck … either way, a large shark’s bite is usually fatal … and believe it or not, the bigger the shark, the less the pain … oh, if only this was a poem, it could end in vain.